Such an odd but lovely morning. I made scones but forgot the salt. Oh well. They were still pretty satisfying. But then my kid asked if I forgot the sugar. Goodness no I did not forget the sugar — these are scones not muffins, child! And then on our sticky slog home we were rewarded with a cardinal and grasshopper sighting. 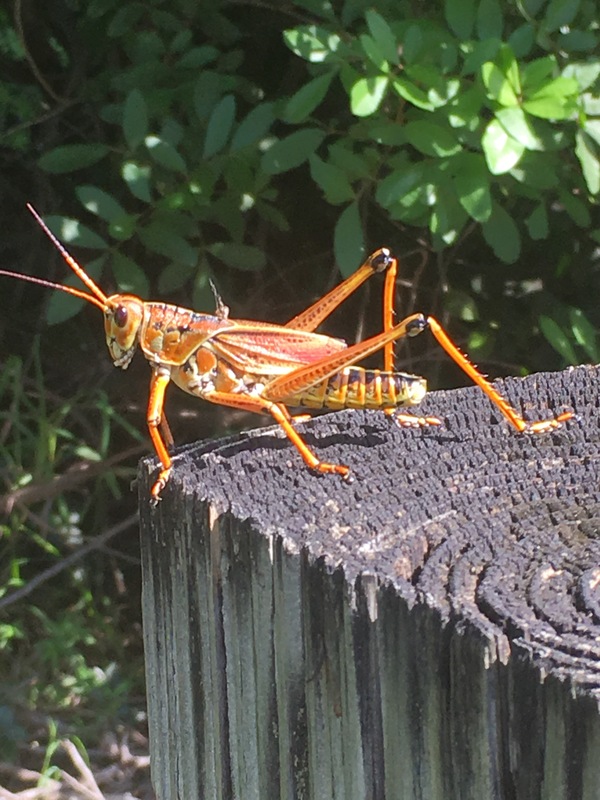 Can you get over the size of this grasshopper? They say everything’s bigger in Texas, but it seems to be true for Florida too. Here I now sit, sipping iced coffee and savoring a few moments alone as the rest of my small but mighty family swims. Pure joy for this introvert mama! Taking it slow, savoring the gifts. (And even those saltless scones). Just Follow the Joy! • This entry was posted in motherhood and tagged coffee, daily life, fourth of july, holiday, mindfulness, scones, slice of life, writing. Bookmark the permalink.